Reynoldstown is a historic neighborhood on the east side of Atlanta, Georgia. 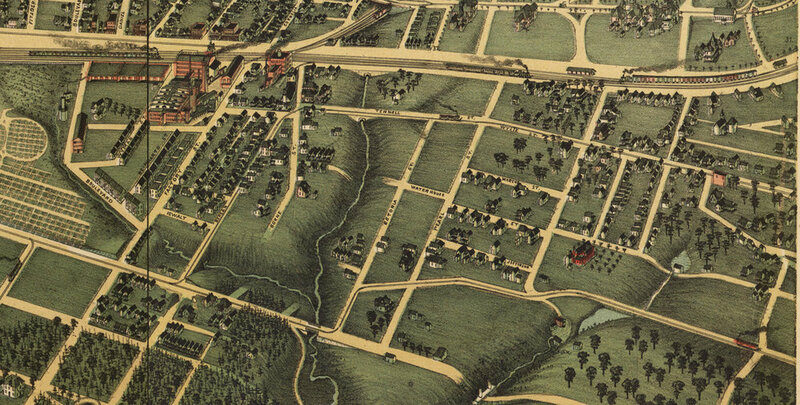 1892 rendering of Atlanta. Reynoldstown is the community on the right, south of the railroad and east of the creek that separates it from Cabbagetown. One of the first African-American neighborhoods to develop in Atlanta, Reynoldstown originally began as an area to which former slaves migrated after the Civil War. The Georgia railroad (now the CSX rail line), which ran along the northern section of the neighborhood, became an attractive source of employment for the many displaced freed slaves who migrated to the city in search of work. There was also a sawmill and a ready supply of water and timber for the families who wished to build homes here. Reynoldstown began to form in the 1860s, at the T-shaped intersection of the Central to Georgia Railroad (CSX) and the Atlanta and West Point Railroad (now the greatly beloved Beltline) on Wylie Street. The streets nearest this area – Chester, Selman, Oliver (now Kenyon), and Wylie – were the very first ones to be settled and were known as Tin Cup alley and, later, the Slide because of the muddy conditions there. Some of the oldest houses in Reynoldstown can still be found here. By 1870, the area had become a vibrant community and was known by its present name, Reynoldstown. Reynoldstown was named in honor of Madison Reynolds, a prominent and successful landowner in the area who for many years operated a store on Wylie Street. Madison and his wife Sarah Reynolds had seven children and originally came to this area from Covington. His son, Isaiah P. Reynolds, graduated from Clark College (now Clark University) and, after inheriting his father’s fortune, continued his father's legacy in the area. He dealt in real estate, served as an advocate in civil disputes, and erected a two-story brick store which still stands at 912 Wylie Street, at the corner of Wylie and Kenyon Streets. In the 1880’s, the Atlanta Street Railroad Company extended its trolley system through Reynoldstown, shortening the half-hour walk to the city. The tracks ran down Wylie and played a significant role in bringing white middle-class families into the area after the turn of the century. From 1905 to 1930 the district east of Flat Shoals developed as a series of white subdivisions. Asa Candler, the original Coca-Cola magnate,developed the first of these, a hundred-lot tract stretching from Flat Shoals to Walthall, bounded by Wylie and Kirkwood to the north and South. Late 19th century houses on Kenyon St. In 1909, Reynoldstown became officially annexed to the city of Atlanta. By that time there were four main streets – Wylie, Oliver (now Kenyon), Clark and Flat Shoals Avenue. The intersection of Wylie and Oliver was the hub of the neighborhood. Wylie was the first street to be paved and was for years the only paved street, making it what is still a major thoroughfare of the neighborhood. More than a few of the houses in Reynoldstown were built around the turn of the century and retain their original architectural features. The custom of the time was to build the homes close together, as cars were not such a heavily relied upon mode of transport and sprawling yards were not yet the style. Reynoldstown retains this original structure and as a result attracts many who desire a walkable community with a rich history and architecturally interesting homes. This and the Atlanta Beltline that runs through it make Reynoldstown a haven for New Urbanists and multigenerational families alike.